It was an odd country where the Modocs lived. Their land stretched along for sixty-five miles, measured on the straight line that separates Oregon from California, and it, was thirty miles wide, some in Oregon and some in California. Parts were fairly good for cattle and horses where the earth was rich, but most of it was in hillocks and knolls all stony and so much alike that it was not much easier, than on the water, to find the way without a compass. This land was called the "lava bed country," and it was well named. I suppose many thousands of years ago some volcano must have covered the ground with the volcanic stones and lava which left it so rough and bare. Lost River, which is from thirty to one hundred yards wide, flows in and out among the lava beds till it joins the Klamath River and flows with it to the great Pacific Ocean. The banks of the Lost River are of great shelving rocks rising a hundred feet in air and beneath which are immense caves with openings leading to each other. In some parts there are a few small trees but no large timber, and to our way of thinking it is a desolate country indeed, but the Modocs liked it, especially the clear lake, Lost River, and bushy parts where quail, partridge, and wild turkey were found, for these Indians did not like to raise corn as white men do. They dug up wild onions, lily bulbs, and camas plants to eat, and found plenty of wild duck in the clear lake and Tule pond. In the year 1850 there was a general Indian war in Oregon and northern California. The white settlers, tradesmen, mechanics, farmers, and hunters, and rough men of the frontier, all came together led by a wild fellow called Ben Wright. Now Wright was not a good man, and he planned a surprise and made a dreadful attack upon forty-six Modoc Indians who were quietly sleeping in their tepees. But five of the Indians got away, and among them was one called Sconchin. He was only seven years old then, and almost all his father's family were killed. This boy grew up to hate the white people. He was a tall, handsome Indian and belonged to a band of four hundred Modocs. Their chief was called Captain Jack by the white people, though his real name was Modicus. This chief was dark and brawny, and when he said a thing he would not change his mind. He called his tribe by their true Indian name, Maklaks (the people), and wanted to be known by all white men and Indians far and near as "The very great all-time Chieftain." But he and Sconchin did not always agree, for Sconchin wanted to be war chief and make war against the white people all the time, while Captain Jack liked peace best, though he kept a war-bonnet on hand to use if he needed it. A war-bonnet, as you know, is like a winter cap of red flannel worn well back on the head with a mass of eagle and hawk feathers strung together and hanging down the back to the waist. This is only for war times, and Captain Jack kept one ready, but usually he wore an old soft gray hat with a cord round it, tassels peeping over the brim, and a single eagle feather to show he was chief. He always carried a rifle and two pistols tucked in his belt, but he thought peace with the white men was best for him and for his people. He was a very strong man, too, but he could not govern his Indians unless he did about what Sconchin wanted him to do. In the year 1866 Mr. Meacham, superintendent of Indians for Oregon, sent word north and south to all the Indians to come to Fort Klamath and have a great talk. A good many Indians came and Mr. Meacham thought they really represented their tribes, but neither Captain Jack nor Sconchin were there. However, there was a great bargain, and the Indians agreed to take a small sum of money and go and live on the Klamath reservation. The Klamath reservation where they were to go is a lovely mountain country, only so far above the ocean that very little will grow in it. The lake near by is clear and delightful, with an island in the middle that looks like an ocean steamer, and the springs are cool and fresh. This was just such a place as white people like to go to in the summer, but for Indians no place at all. Captain Jack said: "I haven't sold our land on Lost River and I won't leave it"; and Sconchin said: "Let us fight forever." But after a while, in 1869, Captain Jack said: "It is better than war." So with three hundred men, women, and children they moved the fifty miles up to the great Klamath reservation. But here something unexpected happened. The Klamath Indians were many more than the Modocs, and they were angry that the Modocs had come. The women and children quarreled and the Klamaths sent word to the agent that the Modocs were getting ready to go on the war-path. Then the agent moved the Modocs two miles away, but they had hardly put up their tepees when the Klamaths, Snakes, and other Oregon Indians began to bother them again. At last Captain Jack, to avoid open war, one night with all his people fled back to their old home. But here they were not welcome, the white settlers had their land and did not want them around. Of course, some white people were kind and knew the Indians told the truth when they said: "We have never lost our land, we cannot live in Oregon, we cannot hunt or fish on the reservation, nor gather lily bulbs, wild onions, or camas roots." Good Mr. Meacham finally agreed to give them a reservation on the Lost River and Captain Jack said: "We will bargain and keep the peace." But at Washington people were busy doing other things, and for a long time no word came to say Mr. Meacham could give this land to the Modocs. Captain Jack's heart was sick and Sconchin said: "Mr. Meacham is like all white men, double-tongued and does not tell the truth." At last a new Indian agent was sent to take Mr. Meacham's place. He believed the white settlers who told him that the Indians were bad and that they must be forced back to the Klamath reservation. So a company of soldiers under Captain Jackson went to make them go. The Indians were living in rough tepees or wigwams made of poles covered with brushwood. Some were on the river bank, some on an island. Captain Jackson and Captain Jack had a talk. The Indians did not want to go, but their chief said he would rather go than have war. Captain Jackson was trying, through the half-breed interpreter, to arrange the homeward march, when Scar-Faced Charlie, one of Sconchin's friends, angry and armed with a pistol, came out of his tepee. Captain Jackson ordered his immediate arrest by a sergeant, who also had a pistol. The soldier and the Indian fired at the same instant; then other soldiers and Indians fired. At the same time some white men, back on the island, were shooting into the Indian tepees. Five soldiers were killed or wounded and as many Indians fell. Then the Indians, in the confusion, got away. They caught up everything and ran southward, while Captain Jackson, gathering up his dead and wounded, made his way sorrowfully and slowly back to Fort Klamath. The young Indians in their flight went through a white settlement and killed eleven white men and boys who came in their way, but they spared all the women and the smaller children. You remember I told you of the wonderful caves on the banks of Lost River. To one of these Captain Jack led his band. From here he could see everything for five miles, and this cave led to other caves, so that without being seen he could make his way to the water's edge. Captain Jack had not more than seventy warriors, but they were in that strong place with food enough for three months for his men and for all of his women and children who were in there. Every Indian had a rifle and pistols and considerable ammunition. Against them Colonel Frank Wheaton of the army led six hundred soldiers. They were confident and ran briskly toward the stronghold, but the Indians were ready and beat back all the six hundred, having slain thirty-five of Wheaton's men and wounded many more. Colonel Wheaton was astounded. He drew off his soldiers and retreated twenty miles. A little later, however, the soldiers returned, bringing cannon and mortars. The mortars would throw a loaded shell high in air and drop it down in Captain Jack's fortress; lodging in the cracks and fissures, the fuse would keep burning till the shell, like that in blasting rocks, would explode and the fragments of iron fly in every, direction. The Indians at first feared those "guns that fired twice every time," but soon they learned how to protect themselves. Then General Canby and Colonel Wheaton encamped before the cave with an army of soldiers. Rev. Mr. Thomas, Mr. Meacham, and some other peace-loving friends tried to bring about a good peace. The sent into the stronghold a half-breed interpreter and a conference was secured. Captain Jack even yet desired a peaceable settlement, but he did not like the offers made him of a new reserve near Lost River by and by after purchases of land could be made, and meanwhile for the Modocs to go down to Angel Island, near San Francisco, and be provided for. Though Captain Jack appeared to favor this arrangement the most of his warriors showed and ugly disposition, and, stirred up by Sconchin, were for war, war! Then Captain Jack, who had been planning in his mind a great blow, sent word that he and a few of his principle men, five in all, would meet General Canby and five of his peace men at a place between the lines about a mile from the soldiers' camp. At the time appointed they met, but the Indians had pistols hidden in their clothing, and after a short talk, when everything was arranged, Captain Jack cried out: "All ready," and they fired. The good general and Dr. Thomas fell instantly, and Mr. Meacham was badly wounded, but the others escaped, and Captain Jack's warriors drove back all the soldiers who were near enough for them to reach with their rifles; then they ran quickly back to their stronghold. Now more troops came, and little by little Captain Jack saw his Indians grow less. The soldiers captured his spring of water and cut his people off from the lake till, in desperation, one night the Modocs without any warning fled to another cave, four miles away. 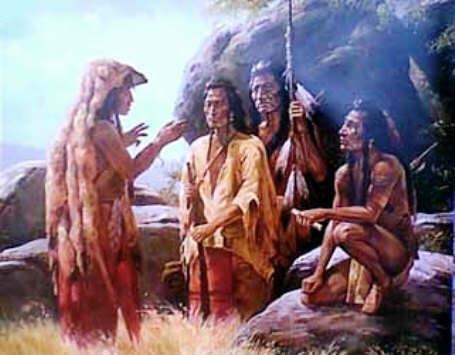 Some Warm Spring Indians, friendly to the white people, trailed the fleeing Modocs, and after many days and great losses among the soldiers the desperate Modocs had so few warriors left and were so much in want of food and water that a part of them came out, gave themselves up and betrayed their leader, Captain Jack. He was the last man taken. He, a few weeks later by the sentence of a military commission, suffered death together with a few of his principal men. This story of Captain Jack is featured in the book entitled Famous Indian Chiefs I have Known, by General Oliver Otis Howard, New York, NY, The Century Co. 1916 that was first published in 1908.